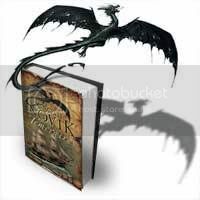 Fantasy author Naomi Novik, whose Temeraire books were recently optioned for film by Peter Jackson, told SCI FI Wire that the eagerly anticipated fourth book in the series is due out in fall 2007. “The working title is A Brazen Armament, but that is definitely going to change,” Novik said in an interview at the December New York Review of Science Fiction reading in New York earlier this month. You can read the entire revealing article by John Joseph Adams HERE.